Don't sweat, Sparkle! Our soft, four-way stretch cotton headband is adorned with over 300 premium, glistening rhinestones. Show your Cheer spirit on the floor and off in this comfortable, tailored-fit headband made to stand out. Also features a crystal rhinestone cheer bow! Will fit ages 4 to adult. Wash with like colors, tumble dry low. 95% Cotton /5% Spandex. 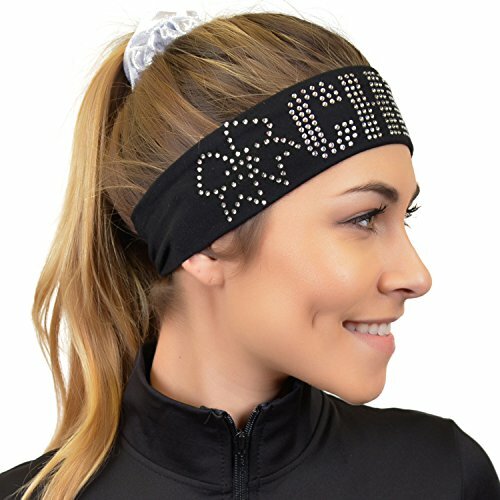 2 ¼ " wide headband / Available in 3 colors/ Made in the U.S.A.
Soft, four-way stretch cotton headband adorned with "CHEER" and a cheer bow in over 300 Premium Rhinestones. Will comfortably fit ages 4 to Adult.